In early April, GM registered the domain name GMRestructuring.com, the same URL naming schema as Chrysler's bankruptcy informational site ChryslerRestructuring.com, well ahead of their scheduled expected bankruptcy at the end of this month. 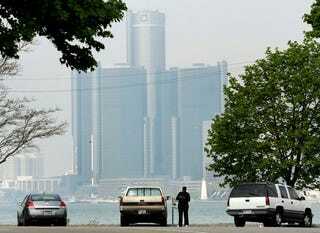 While nothing currently resides on the site — it's simply a placeholder after all — we can expect it to house everything from court documents to lists of creditors to the price of the big GM logo on the side of the Renaissance Center. The domain, initially registered by former GM subsidiary and current IT provider EDS, and now held by GM, seems to indicate a bankruptcy at the end of this month is a foregone conclusion. You know, if you needed yet another indication of said end-game.